Sarcoidosis is an idiopathic chronic, systemic, and noncaseating granulomatous disease involving multiple systems. 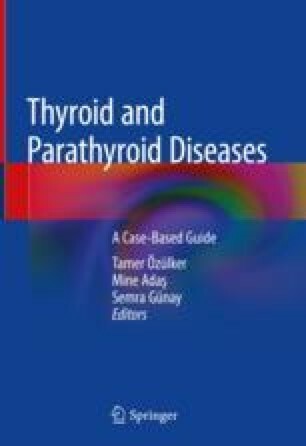 There have been reports indicating that there might be an association between autoimmune thyroid diseases and sarcoidosis. Pulmonary sarcoidosis has also been known to coexist with malignancies including differentiated thyroid cancer. It is not clear whether patients with sarcoidosis tend to develop malignancies or malignancies induce sarcoidosis. Overlapping of clinical and radiological findings between malignancies and sarcoidosis causes a difficulty in the management. We present a case of a 49-year-old female patient who had sarcoidosis, autoimmune thyroid disease, and differentiated thyroid cancer. We would like to thank Professor Dr. Kerim Sönmezoğlu for kindly providing Fig. 9.1 from the archive of Cerrahpasa School of Medicine, Department of Nuclear Medicine, İstanbul, Turkey.